Although not displayed in conjunction with the helms at the above museums, it is present on almost all of the grave effigies. 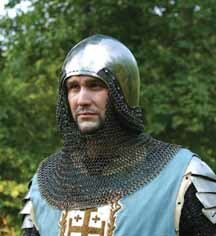 Worn under the Great Helm, it is made for superior head protection and could be worn alone for foot combat. Adjustable liner.